Christ is Risen! ¡Cristo ha resucitado! Si Kristo ay nabuhay! Xristos Kuxwoo-digoot! 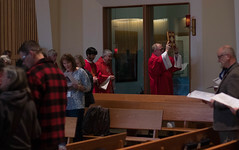 We are at the beginning of the glorious fifty days of the Easter season, when the Church rejoices in the saving death and life-giving Resurrection of Jesus, and reflects on the Easter sacraments with the newly baptized, with those baptized Christians who entered into full communion with the Catholic Church and with all of the faithful who renewed their baptismal commitment. I am grateful to have celebrated this year my first Paschal Triduum as a bishop and as the chief shepherd of this local Church. 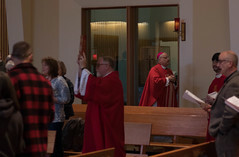 After presiding at the Cathedral at the Evening Mass of the Lord’s Supper on Holy Thursday and the Celebration of the Lord’s Passion on Good Friday, I celebrated the Easter Vigil at St. Paul the Apostle parish in Juneau. It was my joy on that holy night to baptize one of our Elect and then after receiving five baptized candidates into full communion with the Catholic Church, to confirm them and then witness them complete their Christian initiation when they received the Lord’s Body and Blood for the first time. Throughout the Easter season I will be traveling throughout the diocese to confirm young people and adults in their parishes. One change you may have noticed is the new masthead of our paper with the title “The Inside Passage: The Catholic Newspaper of the Diocese of Juneau”. Until a few years ago, this was the title of the diocesan newspaper. I decided to bring it back because I like the way in which the Inside Passage waterway, which is part of our diocesan crest and connects all of our far-flung communities, is a striking image both of our connection to each other as the Body of Christ and our journey together as a pilgrim people to grow in holiness in the hope of eternal life in heaven with God. I’m reminded we will soon be celebrating the Sunday of the Good Shepherd on the Fourth Sunday of Easter. I depend on your encouragement, candor, support and above all, your prayers to help me to follow the example of the Good Shepherd as I strive to serve God and the people of this diocese and of Southeast Alaska. Easter joy and blessings to all!